Rotary International District 7930 and Rotaplast International are set to hit a major milestone in 2017. During our mission on October 8th through the 22nd, we are guaranteed to treat at least 100 children, which will put our missions total to over 1,000 lives changed since 2001. A long lasting partnership, District 7930 has been sponsoring and participating in cleft lip, cleft palate and burn treatment medical missions with Rotaplast International. After a short hiatus, our district re-established our connection in 2015 and 2016 with missions to Cebu City, Philippines. Every Rotaplast volunteer from our district has a personal story of how this opportunity to served changed lives, their own and others. Here is the reason we are asking for your support. This child was transformed in 2015 with his first surgery. He was followed up in 2016 to complete his cleft lip and cleft palate deformity. This is a child you will probably never meet, but he and others desperately need your support. There are many more in the Cebu City area that still have not had that help. 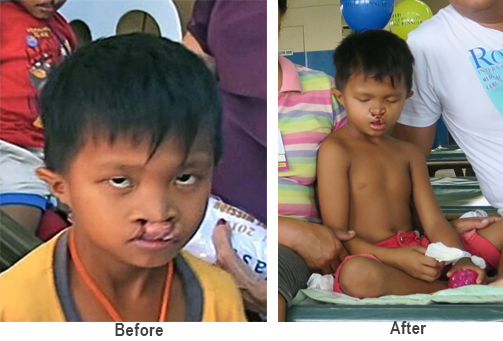 Please consider donating to the Cebu City mission at www.rotaplast.org, or ask your club to support at least two surgeries. Each $600 surgery will change the lives of the children, their parents, their siblings, their extended family. They will be forever in your debt. For more information on this year's Rotaplast Mission to Cebu City, contact DGE Bob Wood.